Investment allocation and retirement planning for income is a different animal from investing for accumulation. Put simply, retirement income planning has a unique set of challenges and requires different tools. But much of the mainstream media is geared around stocks and accumulation strategies, leaving income tools like annuities out of the day to day conversation until it’s time to retire, which may be too late for optimal planning. At their core, annuities are nothing more than insurance for your money. You buy health, life, and home and auto insurance….. what’s wrong with insurance on your money? There are five major risks that are unique to retirement income planning, and we’ll look at how annuities address each of these. Longevity Risk – The risk of outliving your money. Demographic Risk – The risk of the greying of the population on markets and asset values. Market Volatility Risk – The risk of asset value fluctuation. Sequence of Returns Risk – The risk of being forced to sell assets when values are low. Inflation Risk – The risk of eroding purchasing power. 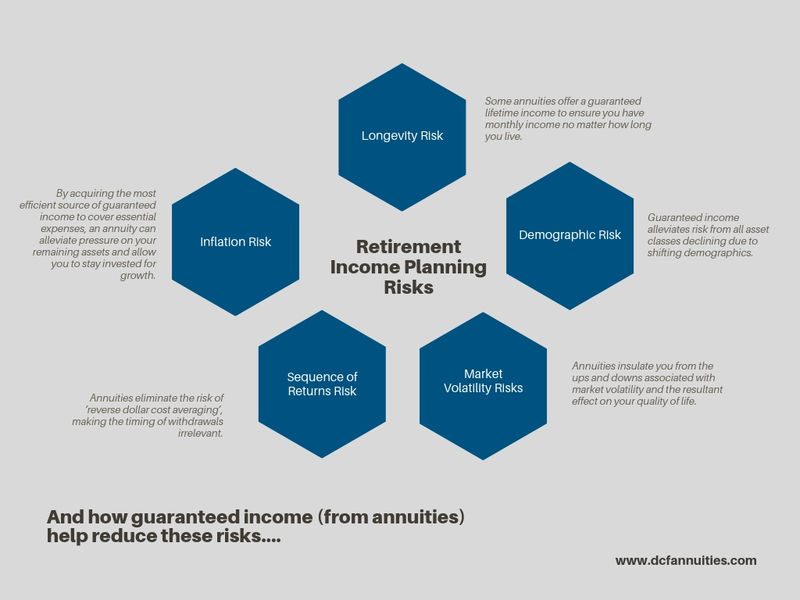 The right annuities effectively mitigate each of these risks. But buyer beware- you might not need to address ALL of them, and no one annuity does all things right. So proper retirement income planning requires that you first take time to know your needs, and preferably BEFORE a specific product enters the conversation. To help guide the thought process, let’s look at these retirement concerns and risks, and see how they are addressed with annuities, and you can decide for yourself if these are solutions that you need. Every situation is unique, so take a few minutes to see what works for you. The risk of outliving your money. The risk of the greying of the population on markets and asset values. The risk of asset value fluctuation. The risk of being forced to sell assets when values are low. The risk of eroding purchasing power. Some annuities offer a guaranteed lifetime income to ensure you have monthly income no matter how long you live. Guaranteed income alleviates risk from all asset classes declining due to shifting demographics. Annuities insulate you from the ups and downs associated with market volatility and the resultant effect on your quality of life. Annuities eliminate the risk of ‘reverse dollar cost averaging’, making the timing of withdrawals irrelevant. By acquiring the most efficient source of guaranteed income to cover essential expenses, an annuity can alleviate pressure on your remaining assets and allow you to stay invested for growth. Our mission at DCF Annuities is to help you mitigate retirement income risks, and assist you in securing the highest possible guaranteed income at the lowest possible cost, tailored to your retirement needs. And annuity is, by far, the best source of guaranteed income. It’s what they are designed to do. If you are interested to learn more about using annuities in your retirement income planning, schedule your FREE consultation today.